After developing extensive experience in varied businesses, Dee followed her passion of wanting to help others and became a nurse in 2005. Her main focus has been holistic and preventive care. After having a full body scan by X to Rays, she was greatly impressed by thermography’s ability to detect many health issues in their earliest stages. X to Rays, LLC was expanding and the fit was perfect. 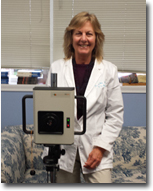 After extensive training, Dee became a certified clinical thermographer in 2013. Since then she has become invaluable to X to Rays and greatly appreciated for her knowledge and caring manner by all her patients.